Liberals crave a comfortable plot, and they'll alter the facts of a story to make it fit one. We are taught to believe that ideology is the enemy of free thought. But that’s not right. Ideology is a mere checklist of principles and priorities. The real enemy of clear thinking is the script. We think the world is supposed to go by a familiar plot. And when the facts conflict with the script, we edit the facts. So, for instance, David Horowitz is a stock villain on U.S. campuses because he deviates from the standard formula of coddling the usual victims and lionizing the usual heroes. Once a committed left-wing radical, Horowitz now resides on the right. Two of his favorite targets are academia and radical Islam. He leads an extensive network of websites, books, lecture series, pamphlets, and conferences aimed at exposing the folly and dangers of both. Horowitz’s detractors, and even some of his friends, sometimes roll their eyes at his confrontational tactics and rhetoric. I then received an even less responsive primer on how student groups are funded on campus. Well, Albahri’s statements were not only within the UCSD community, they were well inside the school’s legal and moral jurisdiction. And yet in response, we don’t get the familiar kabuki of official outrage. Instead we get: This endorsement of genocide is brought to you by Aristotle. The important point here isn’t the school’s double standard. It’s that on campuses and in the wider intellectual culture, people can’t let go of their dog-eared script. It’s not that conventional racism is no longer a problem, nor is it that the civil-rights era no longer resonates. But freaking out over the vestiges of familiar racism is firmly within the comfort zone of contemporary liberalism. Indeed, it’s an industry. Yet when it comes to students like Albahri — and there are many like her — administrators become brainless and lost. Lacking an adequate script, they resort to bromides about Aristotle. Off campus, liberals crave a comfortable plot in which bigoted “homegrown” white men are the villains while Muslims are scapegoats. New York mayor Michael Bloomberg was willing to bet that the Times Square bomber might turn out to be an opponent of health-care reform. What’s the right script? Honestly, I don’t know. But those perched atop the moral high ground will have to climb down to find the facts before they can write it. 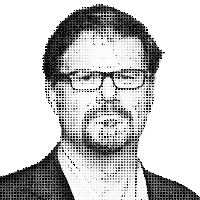 – Jonah Goldberg is editor-at-large of National Review Online and a visiting fellow at the American Enterprise Institute. © 2010 Tribune Media Services, Inc.